What the heck is wellbeing? Here at Brilliant Living HQ and our Changeability Podcast we’re all about helping you and us manage our minds to make changes and have more success and our best life and business. As well as looking at mind management techniques and processes to do this, we thought it would be fun and hopefully helpful to look at some of the key areas of life that many of us want to do something about. Earlier this year we did a series of podcasts and posts about relationships and today we start thinking about wellness and wellbeing. Today is a beautiful day. It’s the first week of May and spring has sprung here in our little corner of England. The evenings are light and the days getting longer every day. The sunshine is making us feel better and it’s amazing the difference it makes. In fact we could say it’s increasing our sense of wellbeing – it certainly feels like that to us. But what the heck is wellbeing? What does wellbeing and wellness mean to us? This notion of wellbeing seems to be everywhere, in the work-place, in magazines, all over the internet, in fact there is a whole wellness and wellbeing industry out there. Wellbeing is big business. It’s a world populated by spas, therapists, therapies, fitness, gyms, dancing, exercise classes, weight loss, relaxation, supplements, closely associated to the health industry and being in a healthy state. Psychologists, economists and policy makers are all interested in wellbeing and try to measure it, so they can use it to understand more about populations and the policies needed in the future. While our focus at Brilliant Living HQ and in the Changeability mind-work is on mind management, it doesn’t mean we ignore the physical or body side of things. The two are totally entwined. We know this is area where lots of us want to change things – and that’s great because we believe mind management is key to making those changes, as much as it is to making any changes in life or business. Is it an area you want to change? Ask yourself if your level of wellbeing is having an impact on your life, work, business, interests, family or relationships? When we talk about wellness in terms of Brilliant Living, we see wellbeing encompassing body, mind and spirit. For us it has to be a holistic definition and approach to wellbeing that takes all three elements into account. 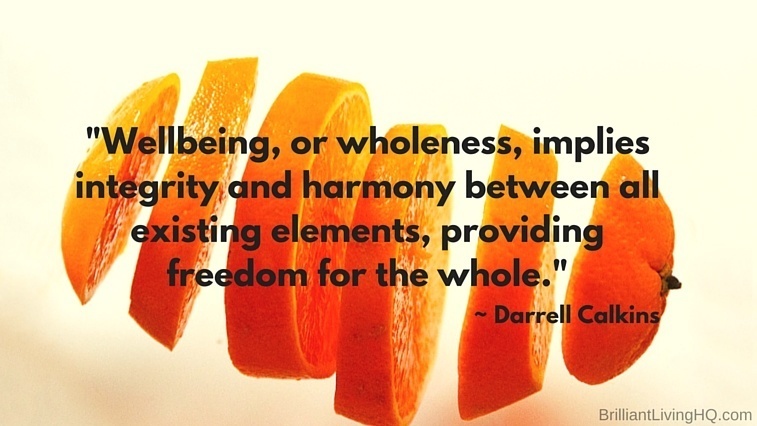 How do you define wellbeing? What the heck does wellbeing mean to you? Thanks to Vicky and Janet for these insightful definitions. Just as health is not the absence of disease, there’s something much more positive to it rather than being just an opposite to a negative thing, wellbeing is something positive in its own right. As Jan points out, it isn’t about the absence of problems, but about being happy where we are – which is a relief for all of us as we’re never going to have a completely problem-free life, but we can still have wellness and experience wellbeing. How we think and feel about wellbeing is context dependent, as wellness and wellbeing are a relative concept. It might change at different times and stages of life, and different levels of health and fitness, but the key to wellbeing remains the same. That’s it really isn’t it? The answer to what the heck is wellbeing is – ‘feeling good’. As our feelings and emotions are connected to our mind this brings us back around to mind management as the way to help us experience wellbeing. So how can we summarise what wellbeing means to us? That’s our quick introduction to wellbeing, what it is (and isn’t) and we’re looking forward to delving into this subject a bit more and talking to some guests about it over the next few weeks. Hear us talk about all of this and much more – including how and 11 year old Kathryn got this definition of wellbeing and times she hasn’t been feeling it – on episode 92 of the Changeability Podcast. Thanks to those fantastic people who’ve completed our ‘Getting to know you’ questionnaire. If you haven’t done we’d love to hear from you. It’s very quick and easy with only handful of questions. It’s anonymous unless you want to leave your details and will help us get to know and serve you better. Thank you.